Greece (Ελλάς, ''Hellas'') is a country in Southern Europe, on the southernmost tip of the Balkan peninsula, with extensive coastlines and islands in the Aegean, Ionian, and Mediterranean Seas. It shares borders in the north with Albania, the Republic of Macedonia (FYROM), Bulgaria, and Turkey. It has an ancient culture that has had a significant influence on the arts, language, philosophy, politics, and sports of western society, including the genres of comedy and drama, western alphabets, Platonic ideals and the Socratic method, democracies and republics, and the Olympics. Furthermore it's a geographically appealing place to visit, with a mountainous mainland and idyllic island beaches. 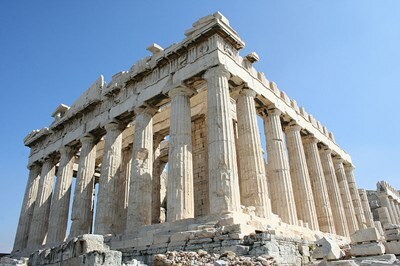 This description uses material from the WikiTravel article on Greece and is licensed under the Creative Commons Attribution-ShareAlike License (view authors). 524 people want to do this. 85 people have done this. Will happen on the 12th of August, 2011! Going to Rethymnon, Crete with my best friend and her family!